Can Tama's tiniest kit measure up? A kit this size is always going to involve compromises, but while the kit is well made, the quality of sound on offer is, in our opinion, a compromise too far. Fails to deliver fully on either portability or sound. Doesn't offer good value. Tama spent just under a year designing and developing the Cocktail-JAM kit. An ultra-compact update of the traditional cocktail kit, the entire set-up packs down into two cases. Comprising a 16"x6" bass drum, 10"x5" and 14"x51⁄2" toms and a 12"x5" snare, all of the drums (with the obvious exception of the snare) are single-headed, allowing them to nestle inside one another for transporting. "The full diameter hardware is made to Tama's usual standard and locks the kit together solidly"
As the kit is part of the Silverstar range the drums share the same specs as all Silverstar drums; so the shells are 100 percent (and clearly high-grade) birch - 6-ply (snare and toms) and 7-ply (bass drum) - and the low mass lugs and Sound Arc hoops are standard Silverstar components. Bearing edges are accurately cut at 45°, while the open bottom ends of the shells of the two toms and bass drum have been sanded flat. The full diameter hardware is made to Tama's usual standard and locks the kit together solidly. A 200 Series Iron Cobra pedal with a modified upward action is supplied, which clamps to a metal bar located beneath the bass drum (spur-like rods from the bass drum plant into rubber feet at either end of the bar). Though listed as an optional extra on Tama's website, a cymbal mounting kit is included in the price of the kit, consisting of a cymbal boom arm and a hi-hat boom which can switch the cymbals between two levels of tension - closed or slightly open. A choice of seven wrapped finishes (all genuine Silverstar options) is offered, with the Indigo Sparkle of the review kit looking particularly attractive. Keen to put the kit's portability to the test, we lug it on foot to our nearest rehearsal studio - just over half a mile away. While we're not quite as ripped as, say, Thomas Lang, we're reasonably fit for our age, yet by the time we reach the studio we're more than ready to put everything down. When we return home later after a post-rehearsal pint (or two) we enjoy the experience even less. Judging by the effort it takes us to get through the pub door, using public transport would be difficult, if not impossible. The kit is quick to set up and by the time the others are plugged in and tuned up Rhythm is pretty much ready to play. First impressions are of a lack of volume and a little turning down on the part of the others is required. But a set of drums this diminutive can hardly be expected to be as loud as a regular kit and, after all, the kit is marketed with intimate acoustic scenarios in mind. 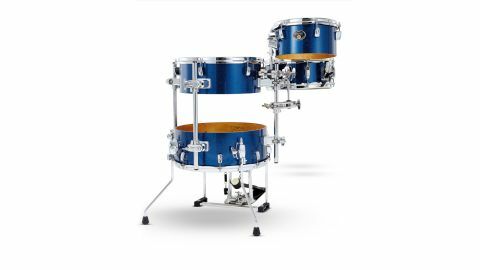 "Careful tuning of the tom rounds out the kick note as, on its own, the bass drum's sound is bordering on insipid"
Soundwise the snare is the strongest component of the kit; it's a snappy little drum and one which could easily be dropped into a larger and more expensive set-up. The same can't be said for the toms and bass drum. Single-headed drums don't tend to have as great a dynamic or depth of tuning range as their double-headed counterparts and can sound jarring as a result. We find this to be the case with the toms - they're either 'on' or 'off' with little in the way of subtlety or warmth to embellish things. The bass drum is not only super-shallow, but permanently faces the larger tom square on (it can't be tilted away). This makes the tom act as a kind of woofer, with each stroke from the bass drum creating lively sympathetic resonance. Careful tuning of the tom rounds out the kick note as, on its own, the bass drum's sound is bordering on insipid, but it all feels a bit Heath Robinson. With no shortage of small double-headed kits available at around the same price, it's hard to see where this kit fits in to the market. As a portable teaching kit, maybe, but beyond that it's too niche a product to rise above novelty value.